From the title of this piece you might assume that I’m anti-bench press. That isn’t the case. I include the bench in all my athletes’ strength routines and will feature it in a future article. This discussion, however, is for people who can’t do bench presses because of a chest or shoulder injury. The problem may be due to a mishap on the playing field or faulty bench press form. Shoulder injuries are very common in athletes who play contact sports. I’ve had years where as many as 15% of my athletes were unable to do flat bench presses. This discussion is also for athletes who don’t want to include flat bench presses in the routines or want to use them as an auxiliary rather than primary exercise. Olympic weightlifters, for example, typically shun flat benches because they tend to tighten their shoulders and make jerking and snatching more difficult. In addition, unless they’re heavyweights, competitive lifters have to be in constant control of their bodyweight in order to make weight for their classes. They don’t want to add pounds to their chest, since the pectorals contribute nothing toward helping them elevate more weight overhead. Many basketball players avoid the exercise because, they say, it restricts their range of motion for shooting and rebounding. even if you don’t fall into one of those categories, you may enjoy benches but have gone stale on them and want to change your routine around for a while. This program is built around three primary exercises: incline bench presses, dips and some form of overhead lifting, such as military presses, push presses or jerks. It also includes useful auxiliary exercises. Since most people resort to this program because of an injury, it’s wise to proceed with caution until you find out what you can and can’t do. Start with military presses and inclines done with dumbells. If you feel no pain with the dumbells, move on to the bar. Do free-hand dips – no weight. Sometimes when athletes say that it hurts to do the inclines, I have them try a slightly different angle. Quite often they’ll find an angle that doesn’t give them any discomfort. If one of these exercises gives you pain, drop it and concentrate on the other two. If two of them hurt, drip them and put all your energy into the one that doesn’t. Eventually you’ll be able to do all three, but don’t foolishly pound away on any exercise that’s doing you more harm than good. I’ll start with the incline. It’s my favorite upper-body exercise because it’s a pure movement. By pure I mean it’s extremely difficult to cheat while doing it. Cheating is another word for sloppy technique. Since incline presses have to be performed correctly, there’s less stress on your shoulders and elbows, which reduces the risk of injury to those joints. What’s more, when you do any exercise perfectly, you get better results than when you use sloppy form. When I see people in a fitness center doing inclines, it’s usually as an auxiliary movement, after they’ve done their flat benches. As a result, they use token weights. They don’t know that in the late 1950’s and early 60’s the top strength athletes used the incline as their primary upper-body exercise. Greats such as Parry O’Brien, Dallas Long, Randy Matson, Al Oerter and Harold Connolly handled well over 400 pounds on the incline. Ken Patera used it to enhance his overhead press and ended up with an amazing 507, which will forever stand as the American record in the Olympic press. So id you decide to make the incline one of your core exercises, plan on leaning on it and pushing the numbers up – way up. Before you stack on the plates, however, you must learn the correct technique. Proper form is essential on this lift, and you must spend adequate time mastering it if you ever want to elevate big numbers. Your form has to be exact, and that’s good because all the muscles and attachments get worked exactly as they should. As a result, gains come quickly and consistently. The first time people do inclines, they invariably touch the bar too low on their chest, close to where they place it for a flat bench. That’s incorrect. Touching the bar low will make it run forward, something you don’t want. The bar should touch high on your chest, just under your Adam’s apple, where your collarbone meets your breastbone. The incline differs from the flat bench in that you drive the bar upward in a perfectly straight line. I tell my lifters to imagine they’re moving the bar inside a Smith machine. Keep your elbows turned out during the incline. 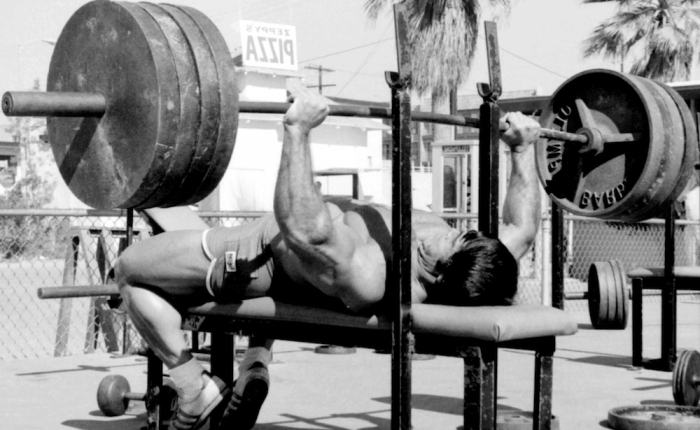 Never tuck them in close to your body as you do on the flat-bench press. 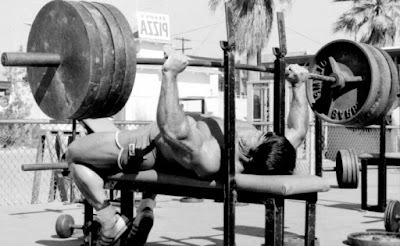 Before you take the bar out of the rack, plant your feet firmly on the floor and squeeze yourself down into the bench. Become the bench (I know it’s trite, but it might help you remember the point). I always insist that my athletes use a thumbs-around-the-bar grip rather than the false grip that many use on the flat bench. The false grip is risky. The bar can slip out of your hand in a heartbeat, and since the weight is directly over your face, the consequences can be disastrous. Another reason the secure grip is better is that it enables you to guide the bar back to the correct groove if it starts to run forward. And heavy weights always want to run forward. With the false grip there’s absolutely nothing you can do once the bar moves away from your body. On the subject of safety: the incline is an exercise that requires a spotter. The spotter, by the way, isn’t there to help you through your sticking point. He or she should only touch the bar once you’ve failed and the help you rack the weight. If the spotter touches the bar before you’ve locked it out, that rep was a failure. The spotter’s job is to assist you in reracking the bar. Often it’s hard to see the uprights because they’re behind you, and you misjudge the distance. It causes the bar to fly over the back of the bench or, worse, come crashing down on your face. So always ask someone to spot you. It doesn’t have to be a particularly strong person, since all he or she is really doing is helping you set the bar back in the uprights. The spotter can, of course, also assist you in taking the bar out of the rack. Once you have it in your hand, push up against it to assure that you have complete control of it. Lower the bar in a controlled manner to your chest. Don’t allow it to crash downward. Pull it into your chest, hesitate a brief moment, then drive it upward forcefully in a straight line. The bar will almost touch your nose. The movement, both up and down, should be smooth, not herky-jerky. When you finish your final rep, have your spotter assist you in putting the bar back in the rack. Make sure it’s securely in the rack before you release your grip on it. Where you grip the bar depends to some extent on your shoulder width, but another important point is that you want to keep your forearms vertical throughout the exercise. if they’re not vertical throughout, you’re giving away some power. Many use a very wide grip, saying that they want to work the outside of their chest more, but that’s really stressful to the shoulder joints and doesn’t let you use as much weight. To find the grip width I recommend for most lifters, extend your thumbs on an Olympic bar so that they barely touch the smooth center. Vary the sets and reps each time you do inclines. At one workout do 5 sets of 5 with a back-off set of 8 or 10. The next time do 3 sets of 5 as warmups followed by 3 sets of heavy triples and then a back-off set. Then do 3 sets of 5 followed by 3 sets of doubles or singles with a back-off set. The slight change will involve the muscles and attachments in a slightly different manner, helping you to make consistent gains. Next on my list of beneficial shoulder girdle exercises is the dip. As with the incline, there was a time when this exercise was considered a pure strength movement rather than an auxiliary one. Here again, there is no way to cheat when you’re doing dips. Olympic weightlifters include them in their programs to help increase their shoulder strength for pressing and jerking. Bodybuilders use them to build cannonball delts. Dips have always been one of my favorite upper-body exercises. I was influence by the uncontested king of the dip, Marvin Eder. He was the first person I ever read about who really pushed the limits of the dip. He did reps with 300 pounds hanging from a weight belt. Add his 200 pounds of bodyweight and it was indeed an impressive feat of strength. Thanks to his amazing dipping prowess, Eder could bench 510 back when 400 pounds was considered remarkable. Another advocate of the dip was Pat Casey, the first man to bench press 600 pounds, reaching 617 in 1965, Pat dipped twice a week, even though he weighed close to 300 pounds. The best dipper I ever coached was Steve Dussia, an Olympic lifter at the University of Hawaii. Steve competed in the 181-pound class and pushed his dips up to 200x5 and 250 for a single. In the process he moved his jerk to more than 350 and developed deltoids that any bodybuilder would envy. In order to dip with any significant amount of weight, you need a dip belt. If you plan on using lots of weight, you’ll also need an apparatus on which you can stack 25-pound plates. It’s a bar attached to a base plate with a hook at the top that attaches easily to the dip belt. Some companies carry this equipment and it’s well worth the investment if you’re serious about doing dips. It’s possible to do dips by holding a dumbell between your knees. I was using up to 100 pounds, but after that it was to awkward. Before adding any resistance, start with freehand dips. Do as many as you can for 4 sets, and when you can do all 4 sets for 2-0 reps, you’re ready for weighted dips. Proceed cautiously; this is concentrated work. Start with 25 pounds and when you can do that for 8 reps move up. The dip is a natural, simple movement, but there is form involved. The lower you go, the more muscles you work, but if going low hurts your shoulders or elbows, stay above the pain. Even with a shorter stroke you’re still going to work your front deltoids, your triceps and the pecs where they connect to your shoulders. You need to do these in rhythmic fashion. Don’t slam into the deepest position. That can be very stressful to your shoulders and elbows. Lower yourself slowly, and when you’re as low as you want to go, drive out of the bottom forcefully. You want to keep your body vertical, don’t lean. And perhaps the most important form point for dips is, DON’T SWING. If your lower body starts swinging around like it’s a pendulum, you aren’t going to be able to handle as much weight, and it can be traumatic to your shoulders. It you start swinging, stop and start over. When you’re handling a heavy weight, the first rep is critical. If you do the first one in perfect form, the rest follow nicely, but if you start moving around on that initial rep, it will get worse as you continue. Most dip bars are fairly high, and getting into position with 100-plus pounds dangling off you is a chore. Here’s what I recommend. Pull a bench up next to the dip bars. Grab the weight between your knees – or some people prefer locking it behind their knees. Either way is fine, just so the weight is under control, which will keep it from swinging. Get in position on the dipping bars and step off the bench. The bench is also handy once you complete the set because you can step back on it. That’s much safer than having to lower yourself to the floor when you finish. As I suggested for the inclines, change the sets and reps each time you do dips. I use this formula: 4 sets of 8, 5 sets of 5 with a high-rep back-off set, 3 sets of 5 followed by 2 or 3 sets of triples and a high-rep back-off set, and, finally, 3 sets of 5 followed by singles to limit and then a back-off set. I don’t put a number of the back-off set. I have my athletes just do as many as they possibly can with approximately 50 pounds less than they used for their final work set. The back-off sets are instrumental in improving the dip. They increase the workload and help the athletes hone their form. One final note on the dip. Always do 1 set of 20 with no weight as a warmup before strapping on the dip belt. Since I focused on pressing movements in other installments of this series, I won’t go into detail on those exercises. If you haven’t been doing any type of overhead work, start with the military press. It will help establish a foundation from which you can go on to push presses and jerks if you like,. Change the way you do the sets and reps on these, as described for the inclines and dips. Stick with 5’s, triples, doubles and singles, and forget about the 8’s. On push presses and jerks use 5’s as warmups, and then do no more than 3 reps on the heavier weights. If this is a new routine for you, do each of the exercises once a week. The incline fits best on the heavy day, the dips on the light day and the overhead work on the medium day. That adheres to the principle, since you’ll use the most weight on the inclines, the least on the dips and something in between on the overhead exercises. Keep in mind that light in this case does not mean easy. You’ll push the numbers up every time you dip. The same goes for the overhead presses. Lean on the top-end lifts ad try to improve them weekly. After doing the core exercises, you can add an auxiliary movement for your deltoids or triceps. My favorite triceps exercise for athletes if the straight-armed pullover. I like it because it’s not as stressful to the elbows as many other triceps movements, such as the skull crusher. Since you’ve already stressed the elbows during the core exercises, it’s easy to overwork them with a snappy movement. 2 sets of 20 works well. Dumbell inclines and lateral and front raises performed with dumbells are also useful. I use the 40-rep rule for all the upper-body auxiliary movements, usually staying with 2x20 but sometimes switching to 3x15 for variety. Before someone writes to tell me that 3x15 is more than 40, I know it is. But it’s close enough to the rule to fit.